I love tomato soup made from fresh tomatoes. This time of year, good tomatoes are hard to come by! This soup uses canned or jarred tomatoes. I highly suggest using tomatoes you canned, froze or a high quality crushed or diced tomatoes. I actually used tomatoes I blanched and flash froze from my summer stash, but you can use fresh or even canned in this recipe. They all taste great. In addition, the fresh basil always looks prettier and does have a fresher taste, but it is the middle of the winter, the dried basil will work just fine. This Tomato Basil Soup is best on a cold night accompanied by any kind of bread, but I am partial to enjoying it with a buttery grilled cheese sandwich. 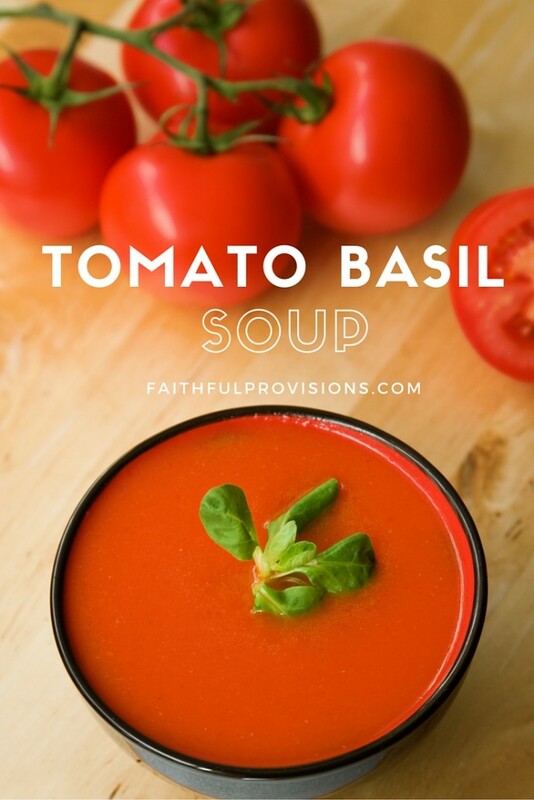 I think you’ll find this recipe is more affordable than most tomato soup recipes, plus it is a healthy recipe that freezes well. Saute onions and garlic in 3 tablespoons of butter until soft. Add crushed tomatoes, chicken broth, and sugar. Bring to boil, then reduce heat and simmer for about 10-15 minutes. Add basil, reduce heat to low; stir in milk and remaining butter. Cook until butter is melted.